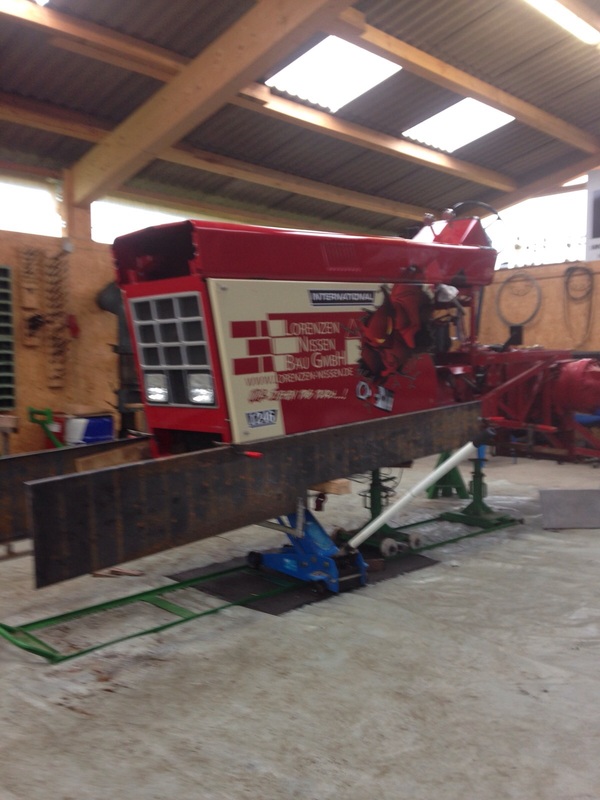 The IHC 1246 Tractor called ,,Red Devil´´ of Mirko Pöhlmann from Behrendorf in Germany got some changes during the winter. 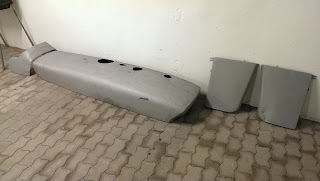 After 3 years in the 3.5t Sport class, Mirko Pöhlmann has decided to make a switch into the 3.6t Super Sport class this year. 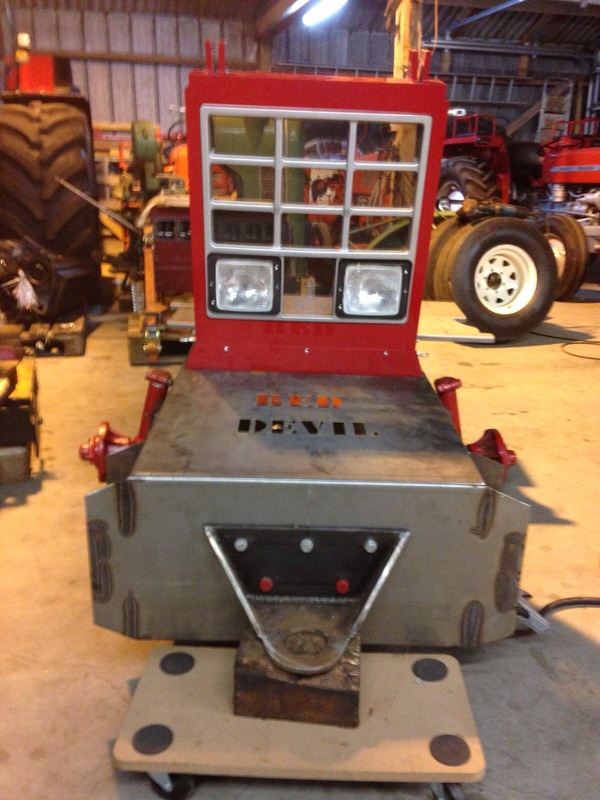 The IHC Tractor got a new wedge frame, a new homemade ROP and the gearbox received a quicker gear ratio. 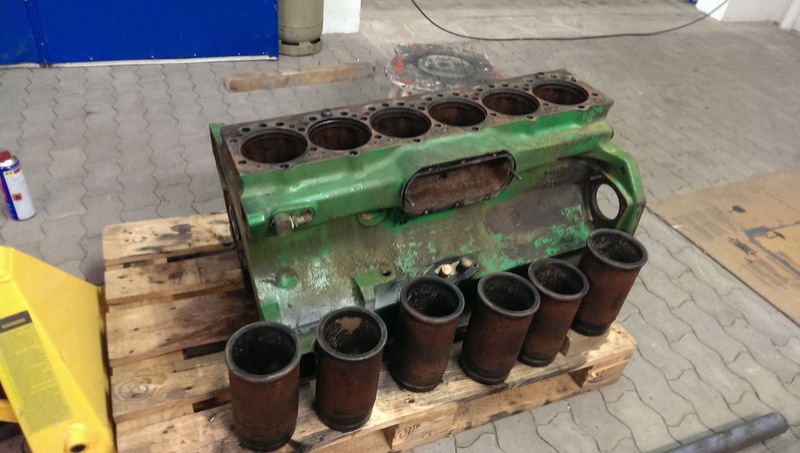 The 6 cylinder IH engine with 6l capacity got a Holset HX 60 turbocharger, new liners and new better pistons. Mirko Pöhlmann will compete in German Championship this year. 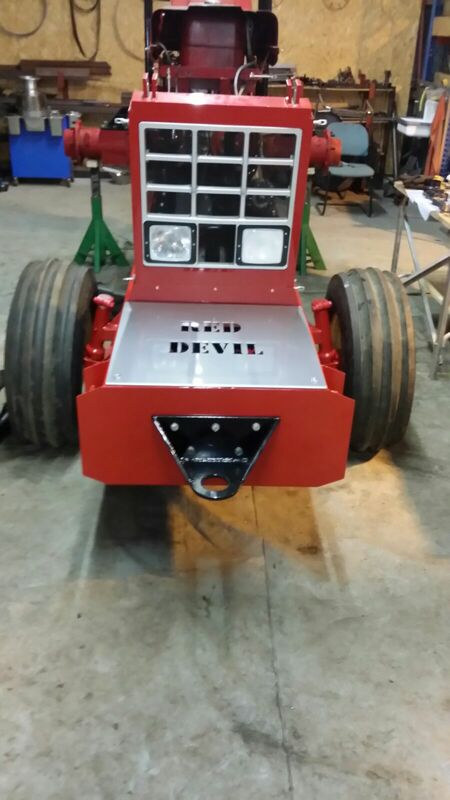 The first start of the Red Devil after those changes is planned for the 23rd of April 2016 in Füchtorf, Germany. HeartBeat Pulling Team stops ! 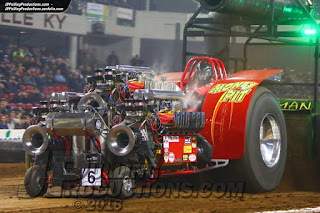 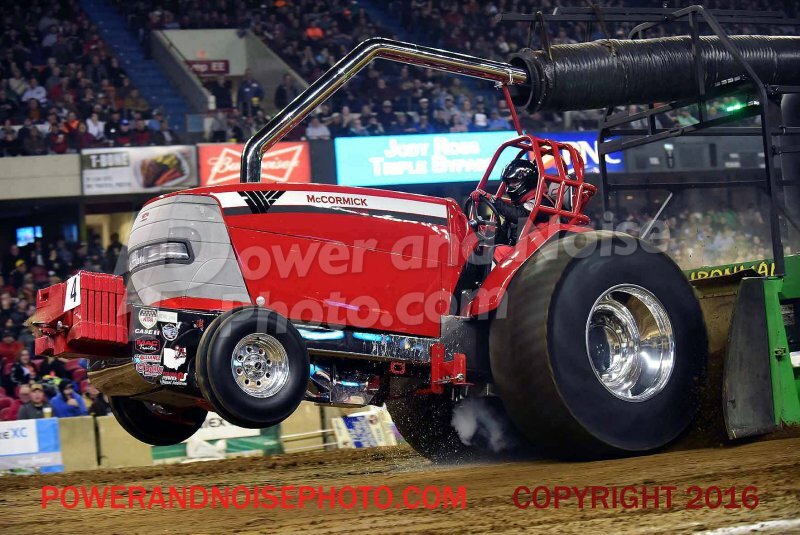 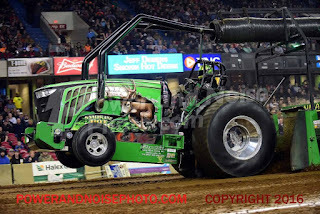 The HeartBeat Pulling Team around Johnny Kraai from Putten in the Netherlands have decided to stop with Tractor Pulling after 24 years. 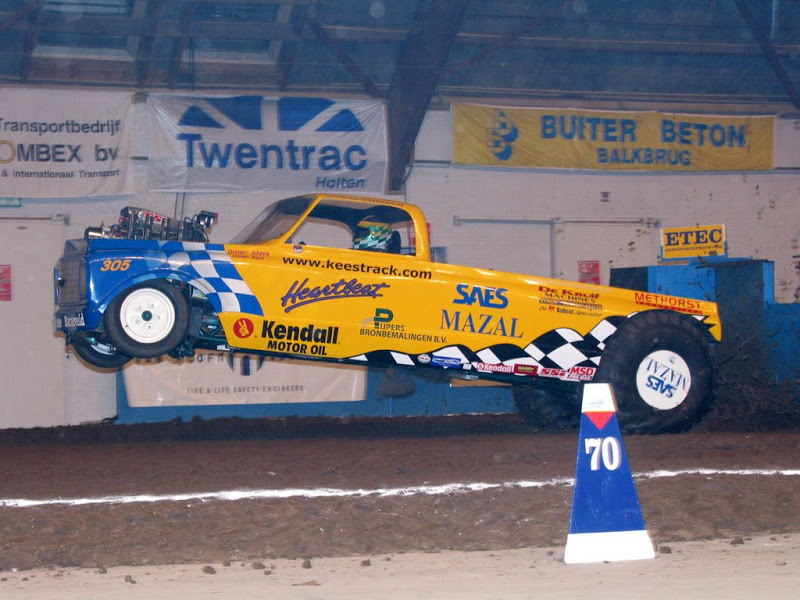 The Dutch Team won in 24 years of Pulling, 9 Dutch Championships and 7 European Championship title in TWD class. Definitely the biggest success for the Team were the 7 European Championship title. 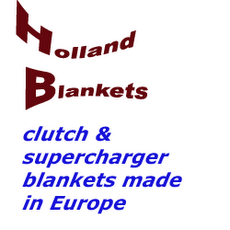 They won amazing 6 European Championships in a row from 2001 - 2006. The Morpheus Pulling Team from Austria has now their own fan page on Facebook. 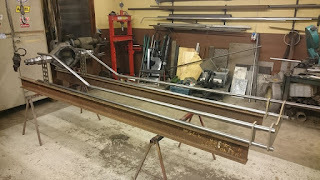 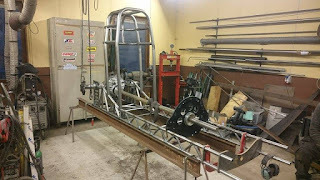 The Nasty Toy Pulling Team from Ljungbyhed in Sweden are working on their Mini Rod called ,,Swedish Iron Toy´´ at the moment. 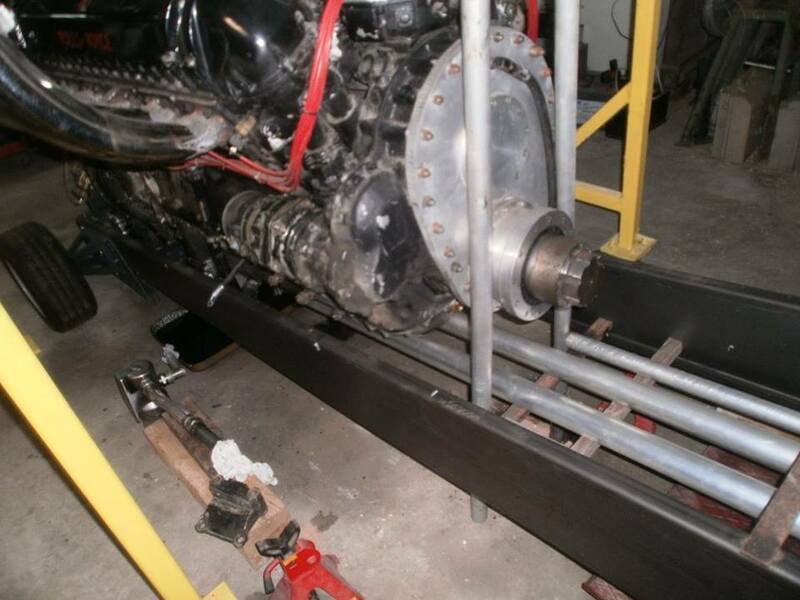 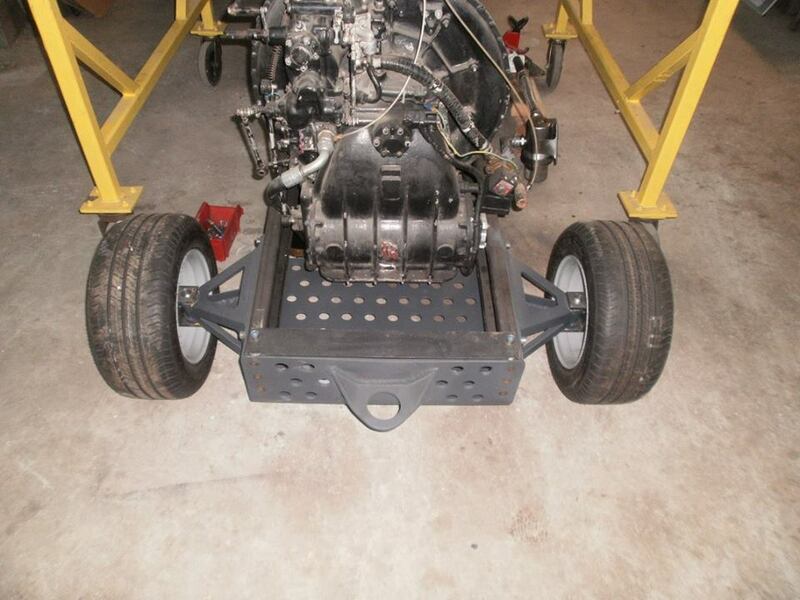 The turbocharged Mini Rod gets a new homemade Docol tube frame with a new Docol ROP and a new rear axle. The drivers position on the new frame is around 60mm more forward and the center of gravety is around 50mm lower than on the old frame. The Team hopes to get a better balance with those changes. The Tractor gets a Ford 9´´ rear axle with a new homemade rear axle housing, ZF planetaries and a Vreemann differential from the Netherlands. Also the Mini Rod gets a set of new rims with Cepek tyres from CM Pulling tyres in the USA. Also the turbocharged BAE V8 Hemi engine of the Tractor receives some changes. 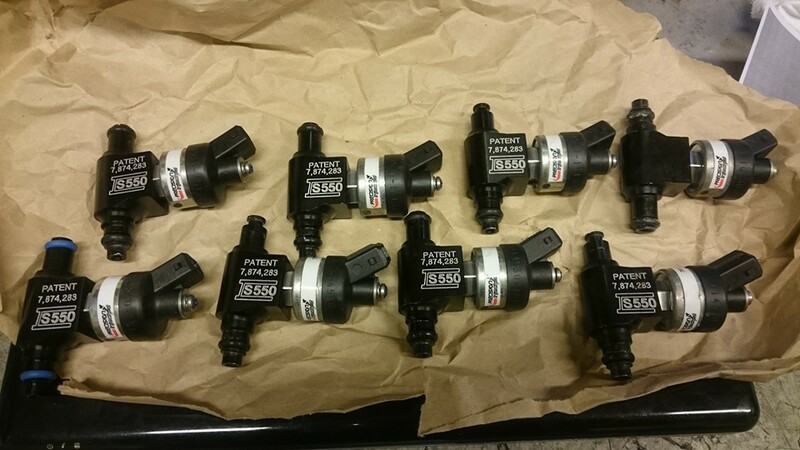 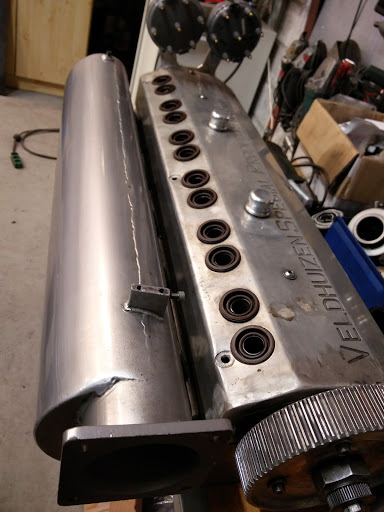 The engine gets a new larger methanol fuel pump, new bigger injectors and a new oil tank from AVIAID for the new dry sump lubrication. 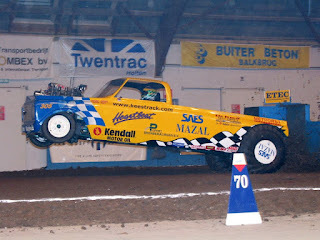 The Nasty Toy Pulling Team will compete in the Swedish Championship and in the Euro Cup this year. 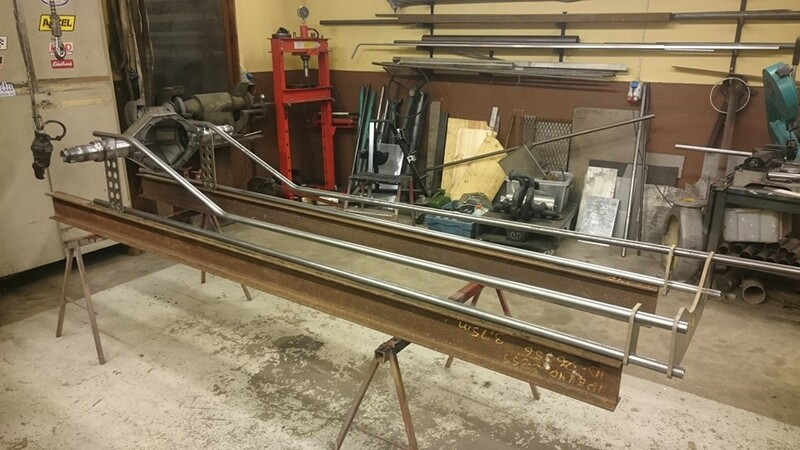 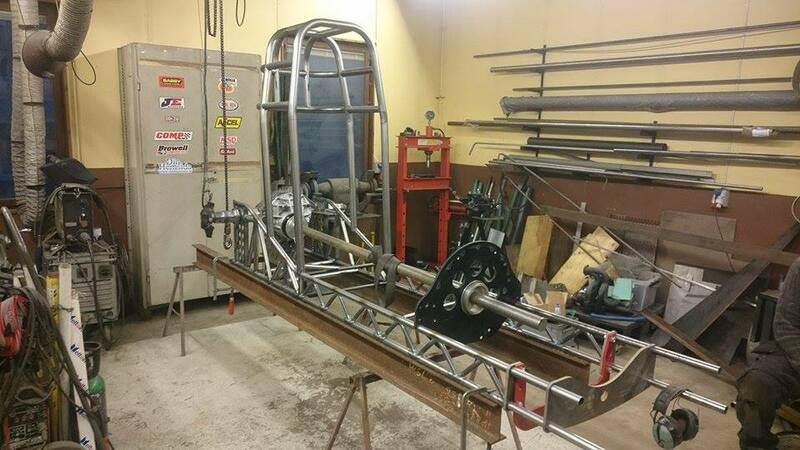 The first start with the new frame is planned for the 20th of May 2016 at the Euro Cup event in Lidköping, Sweden. 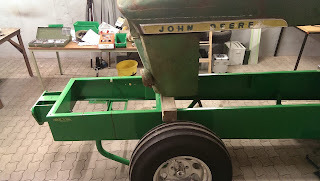 The Old School Deere Pulling Team around Matthias Hoffmann from Wertherbruch in Germany are building on a new John Deere for the 3.6t Super Sport class at the moment. The German Team purchase for their new project the old Pro Stock Tractor called ,,Rage Hart´´ (without the engine, hood and the rear tyres) from Matthias Schedlinski, 2 years ago. 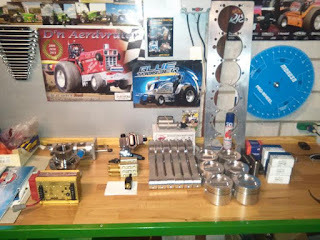 The Team will use for their new Super Sport Tractor the old ROP, the gearbox and the rearend. 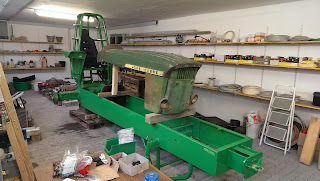 the old wedge frame of the Tractor will be replace by a new constructed homemade Domex wedge frame. 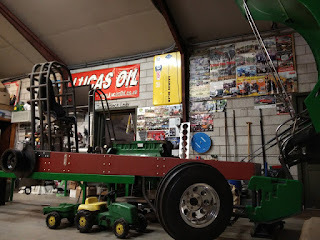 The new Tractor gets a John Deere 4020 hood, a 3 gear John Deere 4320 gearbox with a needle bearings differential from Ron Perry and a new brake system with brake discs. 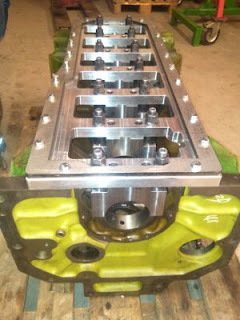 The JD 4320 gearbox come also from the the old Rage Hart Pro Stock Tractor. 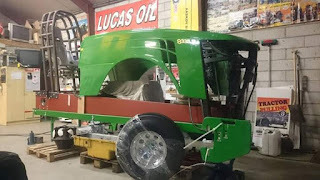 The new Super Sport Tractor will have a JD 6404 engine with 7.0l capacity, a JD stock cylinder head, a homemade intake and exhaust system, a stock crankshaft and Iveco pistons. 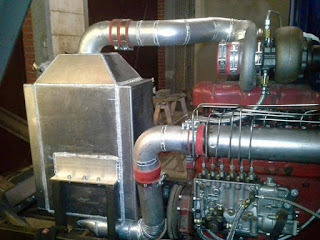 Which fuel pump, turbocharger, rods and Intercooler the tractor receives, isn´t sure at the moment. 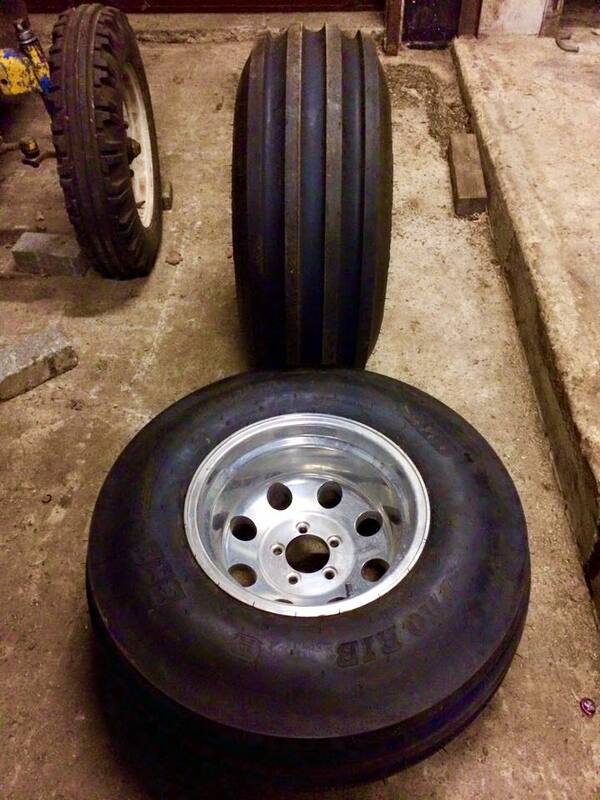 Last but not least, the Tractor gets a set of homemade rims with Michelin 650/65 38 tyres. 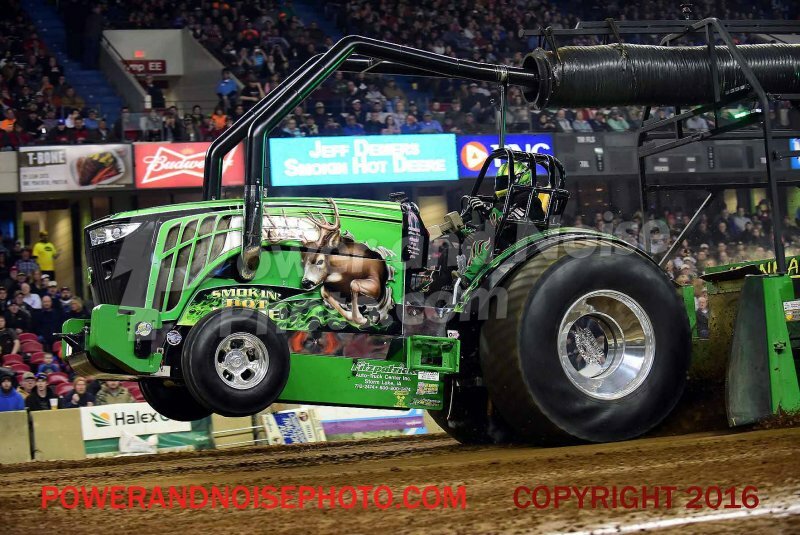 The Old School Deere Pulling Team will compete in the German Championship. The first start of the new 3.6t Super Sport class Tractor is planned for the end of the 2016 season. 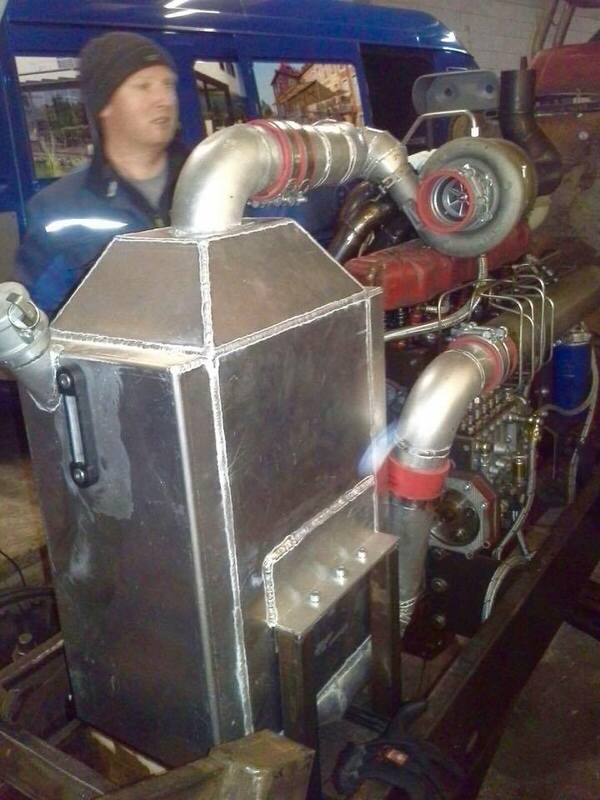 The Catweazle Pulling Team from Bodnegg in Germany are the DTTO Puller of the year 2015 ! The Team around driver Hubert Hofer also won the German Championship title in the Mini Rod division last year. Congratulations to the Catweazle Pulling Team ! 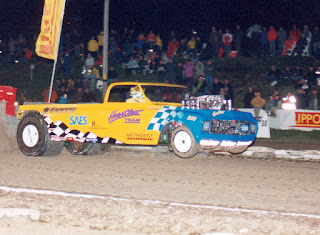 The former Modified Pulling Team called ,,Black Lady´´ around Lars Olesen from Kibaek in Denmark are building on a new Component Alcohol Super Stock Tractor at the moment. 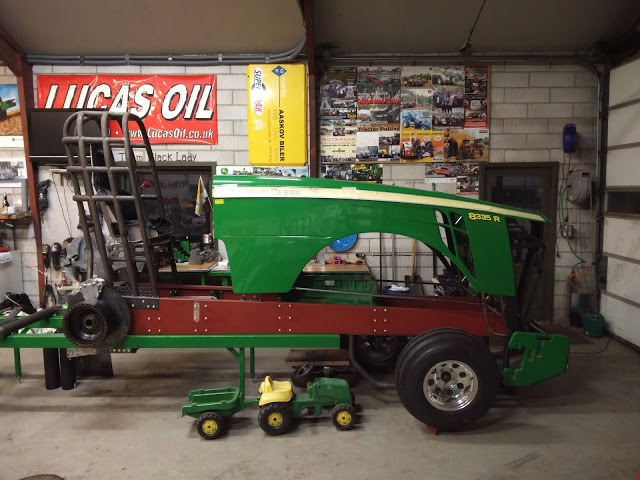 The Component Super Stock gets a Domex 700 wedge frame with a John Deere 8370R hood and a homemade ROP. 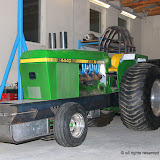 The front wheels of the Tractor are air suspension. 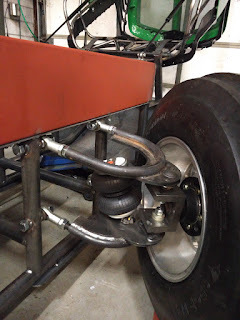 The rear axle housing of the new Super Stock is homemade. 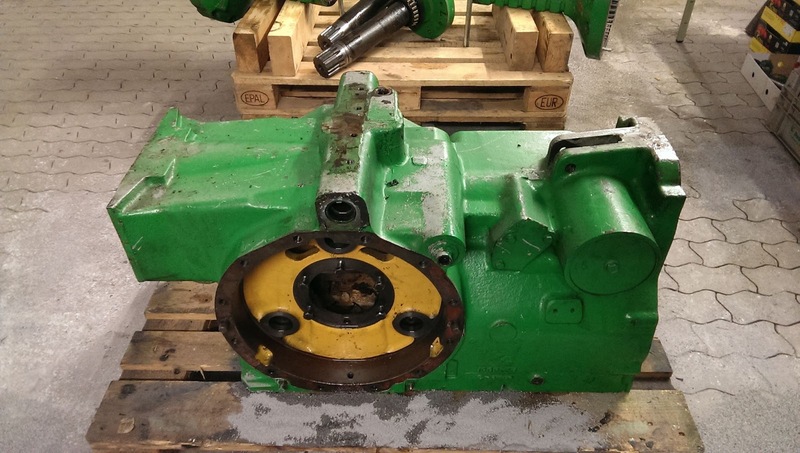 The rear axle gets a Rockwell ring and pinion gear with ZF planetaries. Also, the tractor gets a homemade gearbox and a Eagle clutch with 5 discs. 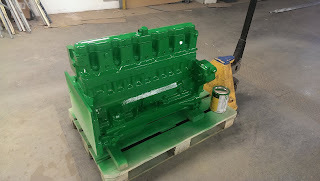 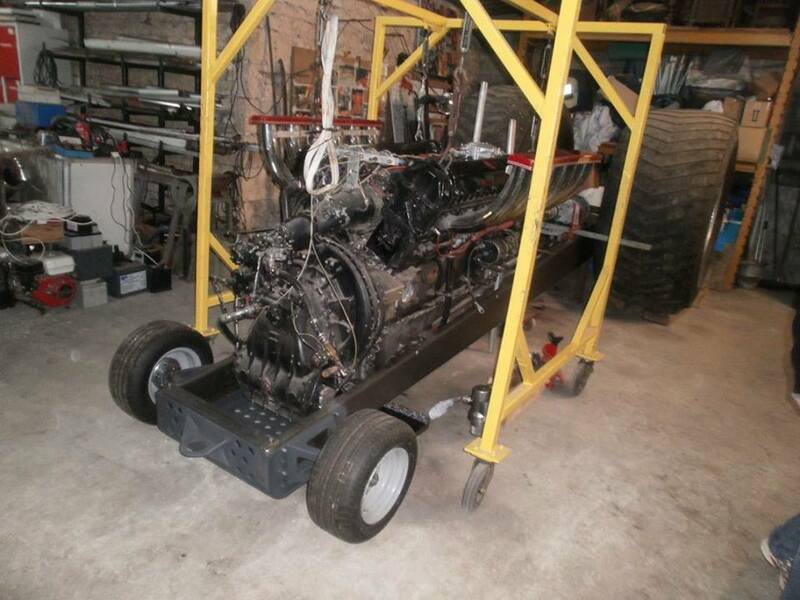 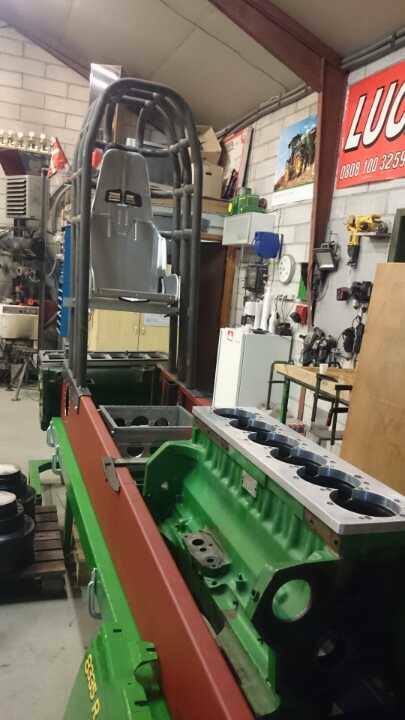 The Tractor will have a 6 cylinder JD engine with 10.2l capacity, a used VSP (Veldhuizen Special Products) aluminium cylinder head with a intake manifold from the Zeinstra Pulling Team, a homemade exhaust system, 3 Holset turbocharger, aluminuim rods and pistons from KMB (Koebrugge Metaal Bewerking), a billet crankshaft, a MSD ignition and a van der Waal methanol fuel injection system. 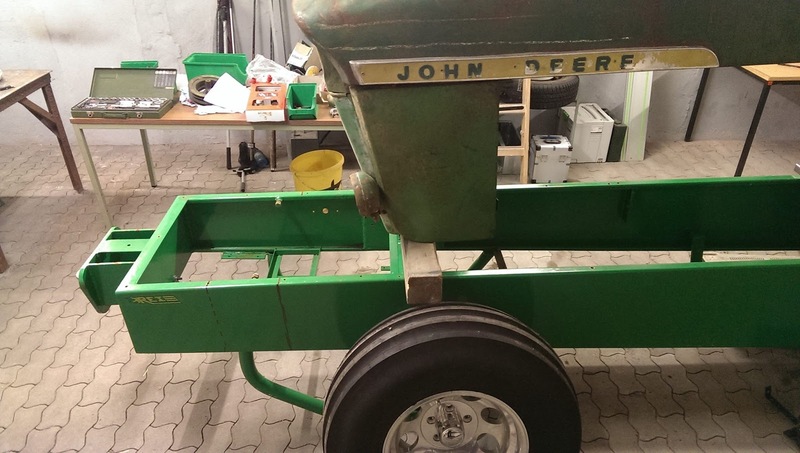 The new 8370R John Deere gets a set of new Midwest rims with Firestone All Traction 8 Ply tyres. 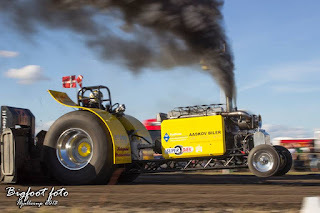 The Team will compete in the Danish Championship and later in the Euro Cup. 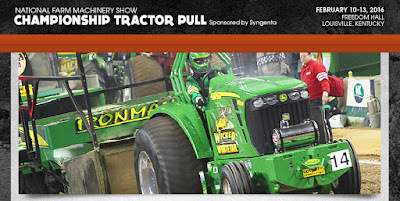 The first start of the new John Deere Component Super Stock Tractor is planned for mid 2016. 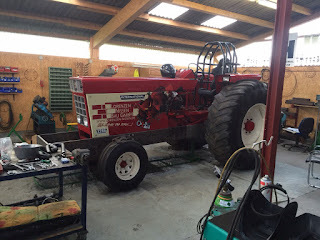 The Red Force Pulling Team from Bad Bentheim in Germany are working on a new Tractor for the 3.5t Sport class at the moment. 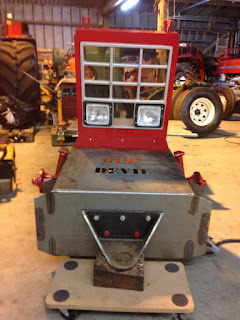 The new Tractor gets a homemade wedge frame with a homemade ROP, a IHC 1246 hood and fenders from a US IH 1066. 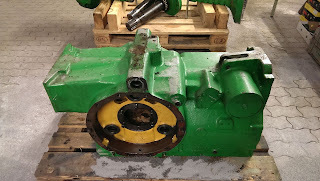 The rearend and the gearbox come from a IHC 946. 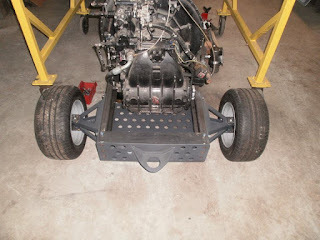 But the rearend and the gearbox receive a other transmisson, better shafts and some better gears. The IHC Tractor gets a 12´´ van Veeken centrifugal clutch with 4 discs. The new Sport class Tractor will have IHC 1246 6 cylinder engine with 5.9l capacity, a homemade intake and exhaust system, a Holset HX 55 turbocharger, a homemade Intercooler with parts from Freakshow Performance and a Bosch P 3000 Diesel fuel injection pump. The IHC tractor gets a set of lightweight rims with cut Michelin 650/65 R38 tyres. 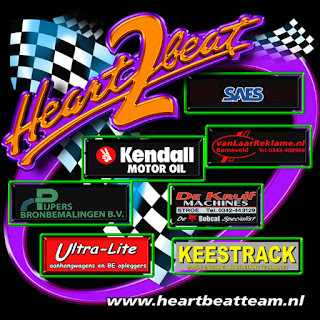 The Team will compete in the German Championship. 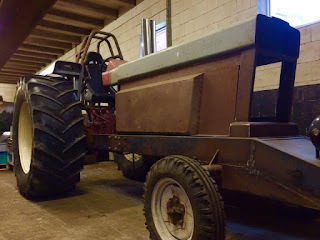 The first start of the new 3.5t Sport class Tractor is planned for 2016. 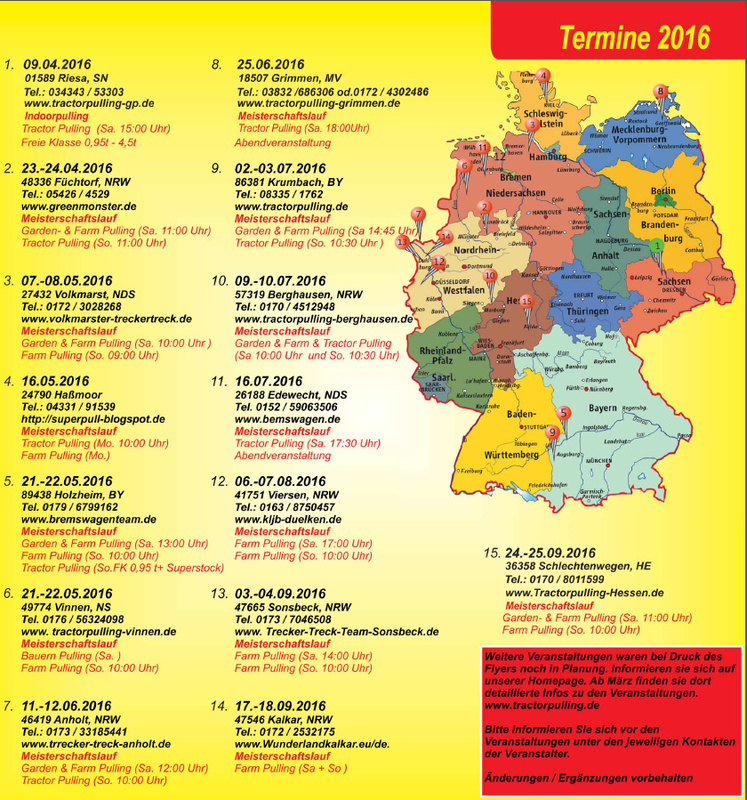 The 2016 European Championships tickets are now on sale on-line book early and save money! 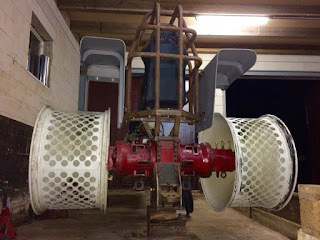 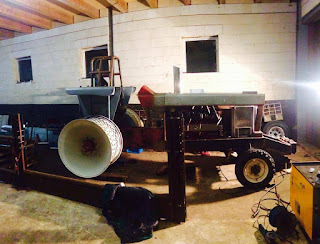 The Neo & Trinity Pulling Team from France are building on a new Light Modified Tractor at the moment. 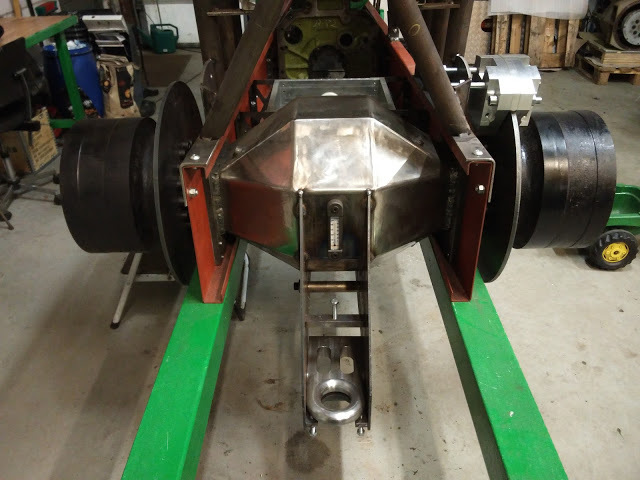 After a lot of years in the 3.5t Modifed class, the French Team has decided to make a switch into the Light Modified class this year. The new Light Mod gets a new homemade wedge frame with a new homemade ROP. 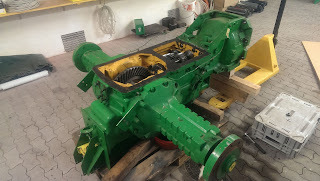 Also the Tractor gets a ZF rear axle with Mercedes planetaries, a Crower clutch and a Kepply gearbox. 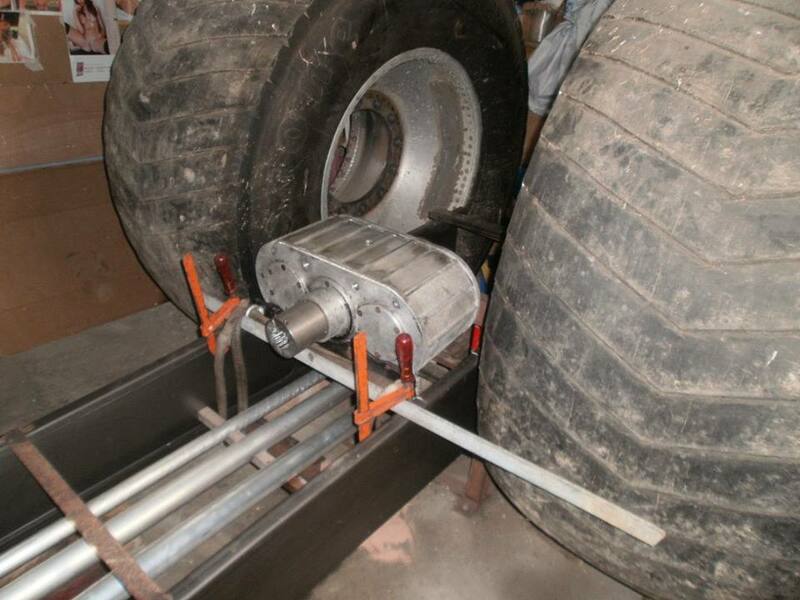 The Team purchase a set of used Firestone Puller 2000 HP tyres with rims for their new Light Mod project. 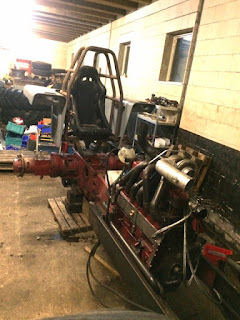 The new Light Mod will have the same RR Griffon V12 engine on petrol fuel as they have used on the old Tractor in 2014. The first start of the new Neo Light Modified Tractor is planned for 2017. 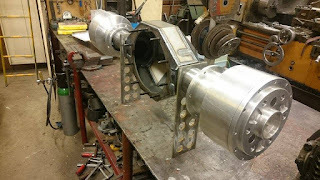 Euro Cup 2016 competitors are known !